We are thrilled to introduce this new product to our customers! While we have built the reputation for being your main source for complete remodels, we also provide quality products and expert design to empower our customers to do the work themselves. At Village Home Stores we value a customer who wants to invest their own time into a project that they will enjoy for years to come. It is not breaking news that shiplap, barnwood, and reclaimed woods of all styles and finishes have become very popular in kitchen and bath design. That is why we are very excited to launch this new self-stick wall plank product that is easy to install for an incredible impact! It truly is a DIY project that is NOT intimidating to take on. What do we mean by a DIY project that is not intimidating to take on? The day our new display arrived for the showroom our owner Jim decided to just install it right away in between appointments. He had it finished well before lunch! Take a look at this video of some of that installation (we admit that did speed it up just a bit for your own sake). This product is meant to be installed by the homeowner. 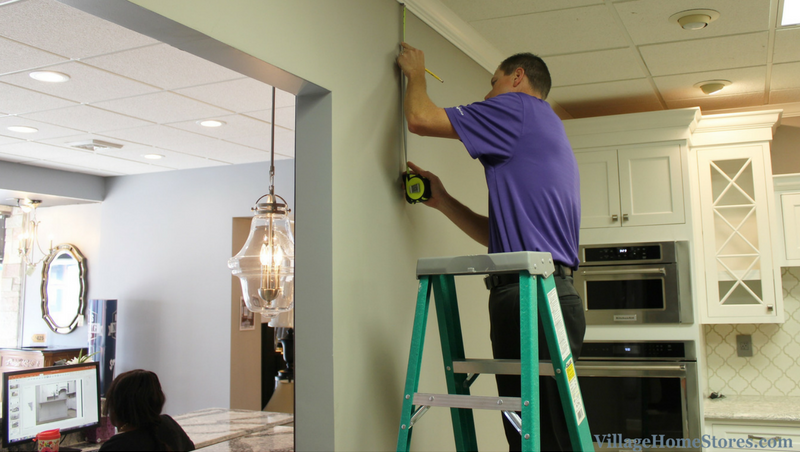 So much so that you can install it using just a measuring tape, pencil, and utility knife. 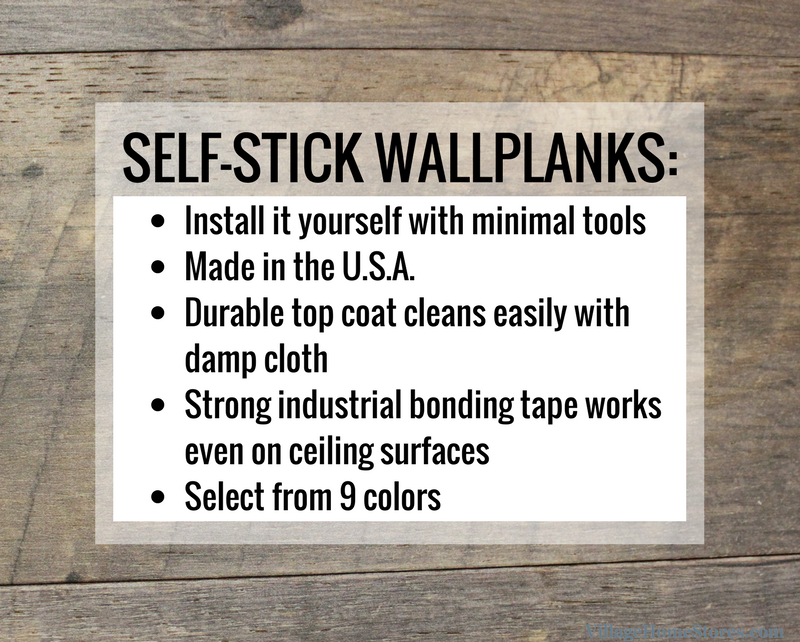 Much like many of our other products at Village Home Stores, these wall planks are made in the U.S.A. The 1/4″ thick panels are sustainably sourced and processed with real North American hardwood. Before installing it is recommended that you allow the wood planks to acclimate to the climate on the interior of your home. This helps to prevent any gapping or cracking in the planks if the humidity changes once installed. Carefully plan your space before you make your first cut. When this product says “industrial-strength adhesive” that translates to “once I’m stuck on the wall I won’t come off without a fight” adhesive. Be sure to measure your planks and mark on both sides of the material before scoring. Double check your wall dimension and your marked material one last time before scoring the plank. Using a straight edge firmly placed along the marked lines, score the planks with a utility knife. You will want to do this on both side of the plank to achieve the cleanest break in the product. Once both sides have been scored successfully, snap at the line firmly securing each side of the plank. Keep your hands close to the line to get the cleanest break. Using your knife or a sanding block, clean up the splintered edges from your snapped planks. It only took a few rows of the utility knife method for Jim to switch to using a saw for the rest of the cuts. This made for quicker and cleaner cuts of the material. If you have access to a saw for use you will be thankful for this option. For areas like outlets and airvents, you can make these cuts using a drill first as a starter hole. Then use a jigsaw or scroll saw to complete the cuts. Always use eye protection when cutting materials with a saw. Remove the adhesive tape backing from the plank and place your first plank. Using your marked guidelines on the wall place your first plank. As your move along with the installation you will want to but the seams of materials together at a slight angle first before allowing adhesive to touch the surface. Once in place, press firmly to allow the adhesive to make as much contact with the surface as possible. If you have one, A “J-Roller” helps with this task. Trim pieces are available if the look of the cut edges isn’t desired. Ask a salesperson about these trim options. Yes you can absolutely use this wall plank system on your ceiling! It is recommended that once installed, you add small 18 gauge finish nails to help secure to the ceiling and take some strain off the adhesive being pulled by gravity. Where can you use these wall planks? They can be installed on any structurally sound, clean, dry, and flat surface. Accent walls, decorative headboards, adding style to the back of an open shelf, the possibilities are endless and we can;t wait to see where our customers use it! It should be noted that this product is NOT recommended to install planks in any high moisture areas such as bathrooms or steam rooms. If you want this wood plank look in these areas ask us about the wood look tile options available from Village Home Stores. 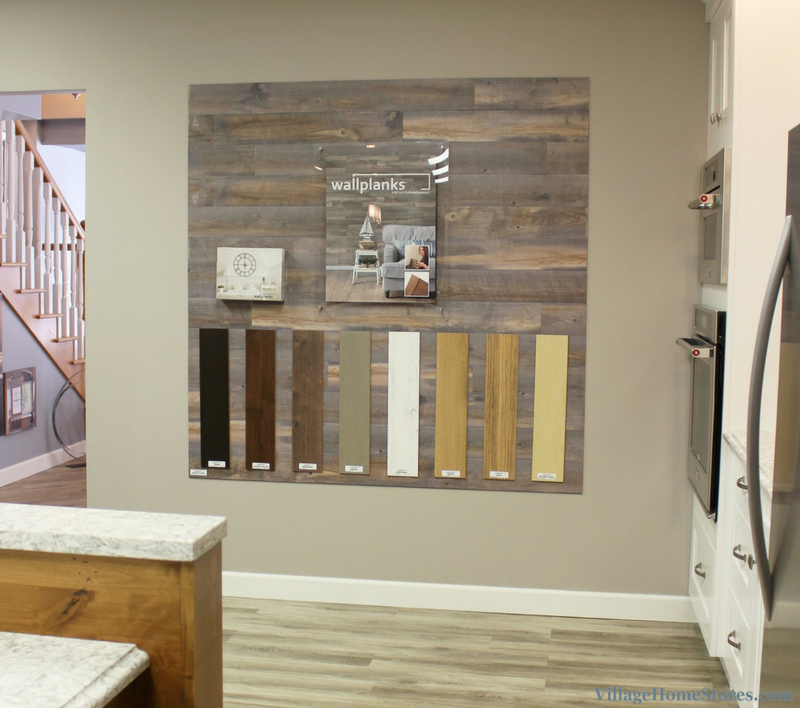 This self-stick wall plank system is available in 9 different finishes all of which you can see on display in our Geneseo, IL showroom. Because this product can be installed by you without any added labor charges it is sold by the square foot and our sales team can help you estimate how much you will need for your project. We are offering this product at an introductory sale price! Please contact us, stop in, or call us with any questions about this great new product! (309) 944-1344.